The cast-iron Adana was first manufactured in England around 1933 by Donald A. Aspinall, of Twickenham, England. Pictured is the third and latest variant of the Eight-Five series which, according to its owner, may be the most common tabletop press in Britain, akin to the Excelsior series in America (see Excelsior Model P). In 1922, Aspinall manufactured his very first press in a rented stable loft in Twickenham, perhaps with some sense of urgency. James Moran writes, “Aspinall, who had been working in a firm selling racing tips by mail, found himself out of a job, and conceived the idea of making model printing presses.” Persuaded by his landlord to advertise the press in the Model Engineer, a hobby magazine, he did, and subsequently “buyers sent money to a man who had made a prototype only. He was so worried that he reported the matter to the police, and asked what he should do. The reply was blunt: ‘Make the presses. 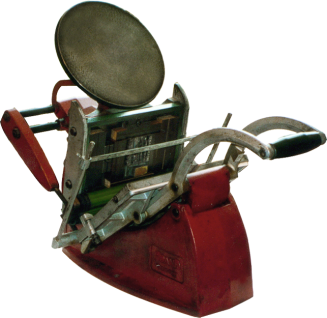 '” Aspinall’s prototype was a version of the Parlour press, a popular hand-inking lever press sold in Britain. To what was basically a platen hinged on a wooden box, Aspinall added a simple means to achieve automatic inking, consisting of a roller pushed over an ink disc by the closing of the platen. When the platen was opened, the roller was pulled over the type in the box. This was the earliest Adana, a distant relative of the rather standard press pictured.